After lengthy negotiations with the Powerhouse Museum and Christina Sumner Principal Curator - Design and Society, the Sydney Quilt Study Group has brokered and funded the acquisition. At the final meeting of the Sydney Quilt Study Group, the members voted to use outstanding funds for the acquisition of a contemporary work by a NSW quilter. (The quilt study group is now known as the Quilt Study Group of NSW and is a subcommittee of the Quilters Guild of NSW). The final choice of quilt was made by the Powerhouse Museum. Torn and layered cotton strips stitched to two layers of cotton fabric. Machine stitched and quilted. Pellon batting. Black cotton backing. Zigzag stitched edge. Signed and dated with embroidery. I've travelled to Condobolin many times since I was a small child to visit my favourite uncle and aunt. Visits to Condo were special, and each visit made a huge impression on me. The colours of the landscape stay in my memory, and the variations from season to season, year to year are enduring images in my colour vocabulary. The trips to Condo were a revelation, my introduction to the extraordinary landscape of the bush. My quilts record my impressions of the journey, the importance of family relationships and my feelings about the passing of an era that meant so much to me. 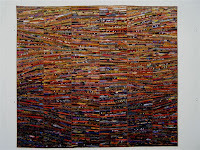 Exhibited in Quiltessence, Fairfield City Museum and Gallery, 2002; Quilt National 2003, toured 2003/2004/2005; Sydney Quilt Show - awarded 4th prize, Art Quilt Open; Stitched in Place, Orange Regional Art Gallery 2007. Published in Show Catalogue for Quiltessence; Quilt National 2003: the Best of Contemporary Quilts.